"A different Caesar salad and it is from your grill! Great with any grilled meat. I use a Caesar dressing from this site." Cut baguette on a severely sharp diagonal to make 4 long slices about 1/2-inch thick. Lightly brush each cut side with about half of the olive oil. Grill baguette slices on the preheated grill until lightly crispy, 2 to 3 minutes per side. Rub each side of baguette slices with the cut-side of garlic and cut-side of tomatoes. Set aside to cool. Brush 2 cut sides of romaine quarters with remaining olive oil. Grill romaine quarters until lightly seared, 2 to 3 minutes per side. Sprinkle grilled romaine with salt and set aside to cool. 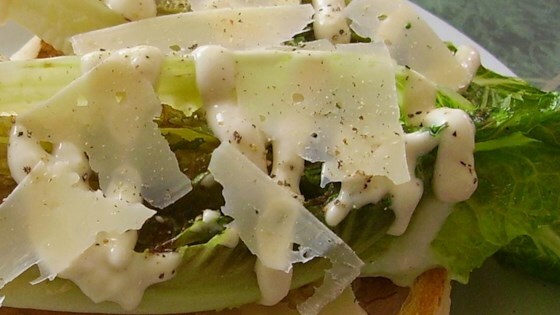 Place a grilled romaine quarter, cut-side up, on top of a grilled baguette slice. Drizzle each with Caesar dressing and top with Parmesan cheese. Season with salt and black pepper. I use the dressing from this popular Caesar salad recipe, Caesar Salad Supreme. I like this concept but it was a little tricky to eat. Make sure you slice the bread thin enough or it gets touch to cut into.